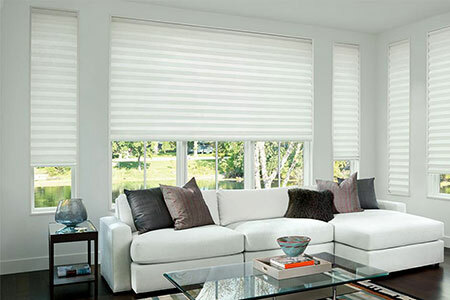 Finding and choosing the perfect window treatment for your home or business premises can be tricky considering the various options available. At Detroit Paint & Glass, we understand what it means for you to have a fitting window treatment and we will do everything to help you find the best match for your home or workplace including going to your location for custom measuring and consultations. Because each room gets different levels of sunlight the specific window treatment will vary depending on the desired outcome. Let our experts support you before, during and after the sale of your window treatments. Not only will you get an expert opinion on how to best design your space for functionality and look but you’ll get a professional to install the window treatment. The variety is daunting but we can simplify the process by listening to your needs, wants, desires and budget before recommending you a personalized option to fit your exact needs. We work with many trusted brands and would only suggest them if we were 100% confident of its quality construction. After all it’s just as much our name on the line as it is the manufacturer. There is nothing more important to us than a satisfied customer. Visit us today or call for a free consultation with our professionals about your commercial or residential window treatment needs.